On Friday, defense lawyers argued that the death penalty trial of five Guantanamo prisoners accused of plotting the 9/11 attacks merited televising to the public. On the final day of the week-long pretrial hearing the issue of televising the trial came up. The accused did not attend the session on Friday after the judge declined their request for a recess to observe and practice Friday prayers. Currently, the public are allowed to watch closed-circuit broadcasts of the Guantanamo war crimes proceedings from a 200-seat theater at Fort Meade. Other closed-circuit viewing sites at different U.S. Army bases are permitted to be used only by the relatives of the 2.976 people killed in the 9/11 attacks, and to the “first responders” including the police and firefighters who helped victims in New York, Washington and Pennsylvania. Marine Major William Hennessy, an attorney for Walid Bin Attash, a Yemeni accused of training two of the hijackers, said “If these proceedings are fair, why is the government afraid to let the world watch?” Bin Attash is accused of training the hijackers at an al-Qaeda camp in Afghanistan. 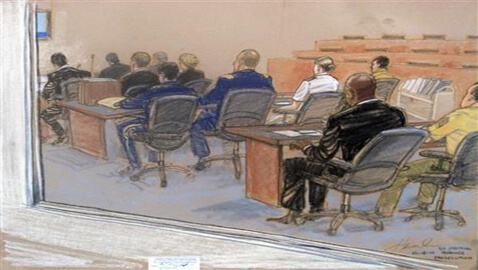 The prosecution maintains that the U.S. public’s constitutional right to an open trial is satisfied by the 200 seat theater at Fort Meade, and no one who wanted to watch the hearings have yet been turned away. The defense lawyers maintain that the situation is definitely against a proper defense as the prosecution has the authority to decide which witnesses and experts requested by the defense as witnesses are relevant and necessary.